Rosacea is a condition that affects people from the northern hemisphere and is very common in Ireland, generally affecting people between 30 and 60 years. While there is no cure, the signs and symptoms can be controlled with herbs and creams. Rosacea is characterised by reddening and flushing of the face and at times can appear as acne with papular and pustular lesions although it can appear on its own. Initially the flushing comes and goes, and at this stage it is easiest to treat, with herbs that “clear Heat” from the face. It can also irritate eyes making them watery and blood shot and can also affect the neck and chest areas. If the redness is present all the time the herbal treatment approach changes to clearing Heat and assisting blood circulation. Other symptoms may include congested capillaries or thread veins may be visible on the cheeks and nose (telangiectasia). Severe cases may also present with many papules, i.e. red ‘bumps’. 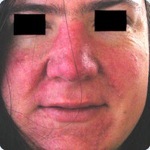 Rosacea may vary substantially from one patient to another, and treatment must be tailored for each individual case. Results with TCM treatment are very good. The milder, fluctuating form of rosacea can be treated in as little as 6 – 8 weeks, whereas the more severe forms, possibly accompanied by acne and pustules, takes from 10 to 16 weeks to control. Roseacea triggers that can result in an outbreak vary from person to person. Keeping a food diary will help you identify the foods that may trigger your roseacea.